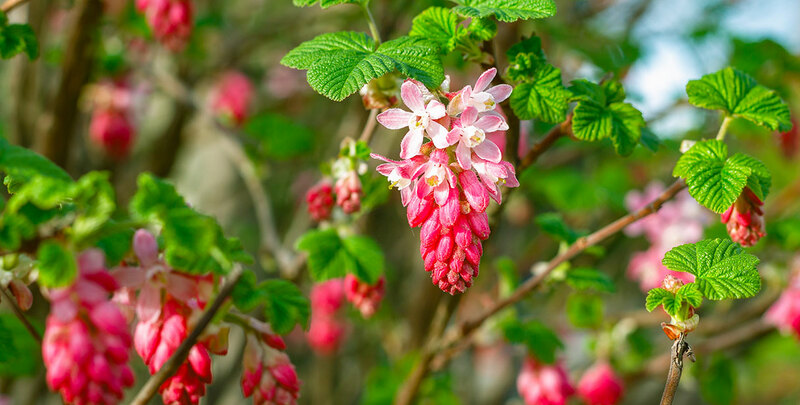 The flowering currant, alternatively known as the red-flowering currant or by its botanical name ribes sanguineum, is an upright, deciduous shrub with crimson flowers that are borne in racemes, with a backdrop of attractive mid- to dark green lobed, aromatic leaves. It is the only flowering species of the ribes genus. The flowering currant ‘King Edward VII’ is a classic – it is the most popular variety of flowering currant and is widely used in hedges or on its own, as a free-standing shrub. This bushy, but compact flowering shrub is mostly planted for its deep red flowers, but it also makes excellent hedges. Since it sheds its leaves, it is not an ideal hedging plant if year-round privacy is what you are after, but the flowering currant will certainly add some beauty to your garden. The striking red flowers of the flowering currant ‘King Edward VII’ appear during springtime and will remain on the shrub throughout the period from March to May, which makes it an ideal component of a mixed hedge with other spring flowering plants. Especially if they have different colours. If you plan on using the ribes sanguineum in a mixed, informal hedge, our recommendation would be to combine this handsome shrub with the forsythia, which offers an abundance of gorgeous yellow flowers. Together, they will make your spring garden a unique, vibrant place. We would like to emphasize, however, that the flowers of the flowering currant ‘King Edward VII’ have a very characteristic scent that some people consider unpleasant. 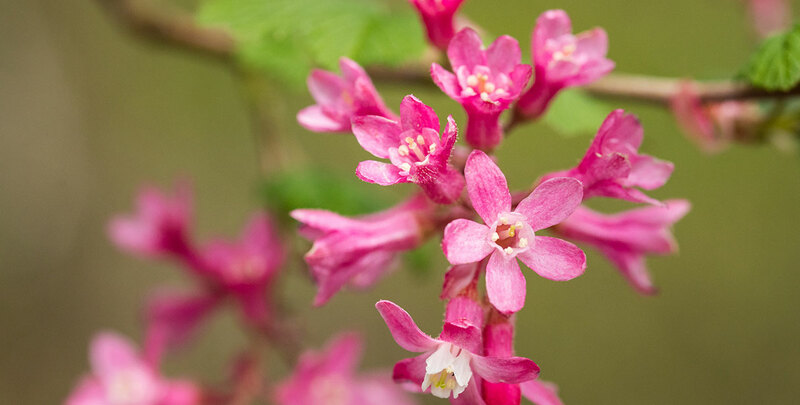 Despite the fact that the most popular variety of the flowering currant is named after a British king, the species is native to the west coast of North America, specifically the area around the Canada-United States border. The plant was introduced to British gardens in the early nineteenth century by the Scottish botanist David Douglas. 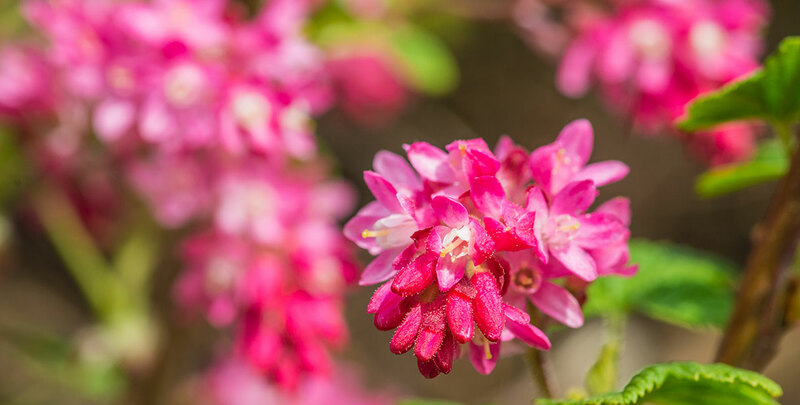 The flowering currant ‘King Edward VII’ was first cultivated in 1826 and quickly became a highly popular ornamental garden shrub, which should not be surprising, given the striking, colourful look of its flowers. While numerous cultivars have been developed through the years with a strong focus on creating different options when it comes to flower colour, the popularity of the ‘King Edward VII’ variety has never quite been surpassed. Yet, the flowers are not the only attraction of this ribes species. The flowering currant has attractive green foliage, which turns yellow, red and pink in the autumn. At the same time, the dark blue or black fruits will appear, giving this spring flowerer remarkable autumn interest. The beautiful leaves and showy berries will light up your autumn garden like the flowers did in the spring. Attractive as these berries may look, we would like to advise against eating them. While they are technically edible in the sense that they are not poisonous, they are not particularly tasty. Wild birds do enjoy these berries, however, and help disperse the seeds of the species. In addition, birds like to seek shelter among the branches of the flowering currant. The flowering currant does not make a formal screening hedge, nor is it particularly large or tall, with an average growth rate of about 20 to 40 centimetres per year and its ultimate height of about 2 metres. However, the flowering currant is a very reliable hedging plant that requires no special care and can even be left unpruned if you are looking for a hedge with an informal appearance. 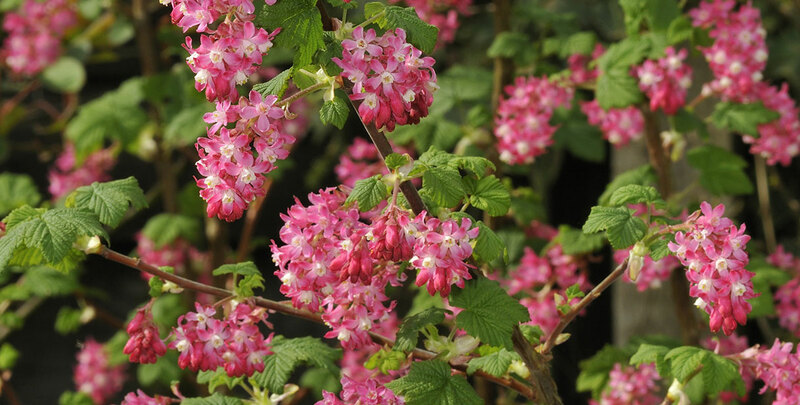 The flowering currant is an ideal hedging plant if you like lush, flowering hedges in the spring. Your garden will certainly stand out and draw a lot of attention once it is flowering, as the appearance of its brightly coloured blossoms simply demands to be noticed. When it comes to soil types, the flowering currant ‘King Edward VII’ is not particularly picky, although it does have a preference for a moist, well-drained soils. It does not mind being planted in an exposed location and will thrive in the full sun to partial shade. However, a sunny position is preferable, as sunshine is beneficial to flowering. While the flowering currant ‘King Edward VII’ does not necessarily need to be pruned, we would advise you to trim your flowering currant hedge after flowering, in the late spring or early autumn. If you want to rejuvenate your hedge, this can easily be done by cutting back all the branches to about 30 centimetres above the ground in mid-winter. During the following spring, your flowering currant hedge will sprout again. A hedging plant variety that which carries the name of a British king obviously has to deal with high expectations, but we certainly think the flowering currant ‘King Edward VII’ is able to meet those expectations. Its showy, crimson flowers, gorgeous foliage and beautiful autumn colouring will make any garden look a little more beautiful – maybe even regal. A flowering currant hedge already looks amazing as a single species hedge, but combining the species with other flowering hedging plants may result in a fabulous, vibrant mixed hedge which is sure to make your garden stand out. While its characteristic scent is always a matter of debate, there is no doubt that the appearance of a flowering currant hedge is a welcome addition to any garden. It has a lot to offer during multiple seasons, which is not all that common among spring flowering deciduous hedging plants. If you are looking for a hedging plant that will provide you with as much colour as possible for as little effort as possible, look no further than the flowering currant ‘King Edward VII’.